With 180 sites listed in the National Register of Historic Places, including 17 historic districts and 2 National Historic Landmarks, Austin puts you in the heart of Texas history. From the Texas State Capitol to the Paramount Theatre, the Driskill Hotel to Barton Springs, the heritage of the Lone Star State lives and breathes throughout our city. We invite you to explore, experience and enjoy these memorable attractions and make our history part of yours. The Texas State Capitol, standing at 302 feet (a whole 14 feet higher than the U.S. Capitol), is a testament to the “everything’s bigger in Texas” mantra. Built on rusticated Sunset Red Texas granite and topped off with a cast iron dome and Goddess of Liberty statue, the Capitol represents the Lone Star State&apos;s best. Just on the southeast corner of the Capitol grounds is the Old Land Building and Capitol Visitors Center & Museum. Built in 1857 to house the state’s land records, it now features a museum with fascinating, child-friendly exhibits about the history of Texas. To round out the complex is the Texas Governor’s Mansion, which is home to the governor and is open to the public for free tours! 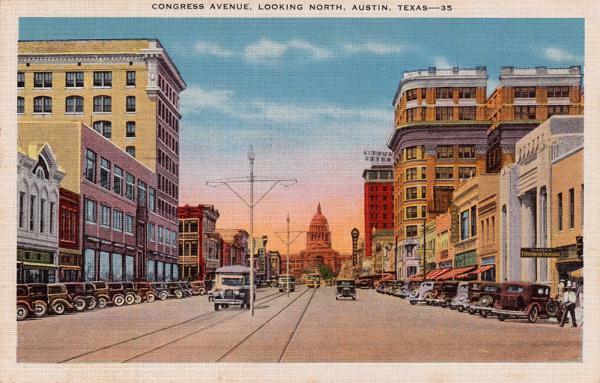 Congress Avenue isn’t just Austin’s main street­ ‑ it is the main street of Texas. Maribeau Lamar, successor to Sam Houston as president of the newborn Republic of Texas, directed that a city be built here in 1839, specifically for the seat of government. His plan called for a 120-foot wide ceremonial boulevard from the river to the hilltop Capitol. Ever since then, the street has been the site of parades, demonstrations, athletic events, movie shoots and unforgettable street parties. Some of the notable buildings on Congress Avenue include The Old Bakery, Walter Tips Building, Paramount Theatre, Scarbrough Building and the Littlefield Building. East Sixth Street is a National Register Historic District, with six blocks of turn-of-the-century Victorian commercial buildings. It is also the heart of the music scene in the Live Music Capital of the World®. Before the music era began, the area was a melting pot of small businesses, with owners from many cultures - European, Middle-Eastern, Asian and more. Notable places include the Driskill Hotel and Museum Row at Brush Square. This historically rich area of Austin lies just east of downtown, across I-35. There, you’ll find some of the more important landmarks throughout the city, like the Texas State Cemetery and the Tejano Walking Trails. Notable places in Old East Austin include the French Legation Museum; a Creole-style house originally established by request of the French King Louis Phillipe in 1841, making it downtown’s oldest building. Also in Old East is the George Washington Carver Library, Austin’s first library, adjacent to the George Washington Carver Museum and Cultural Center which is dedicated to the collection, preservation, research and exhibition of African American cultural material. Known for being the locale for prominent figures and events during its hey-day, the west part of downtown is home to Victorian-style homes of the Bremond Block National Historic District, a compound created to house successful merchants in the late 1800s, as well as courthouses and other historic spaces. Downtown West also includes the Heman Marion Sweatt Courthouse, where Heman Marion Sweatt was backed by the NAACP as he sued the University of Texas after being denied admittance into its law school. The historic case argued here by Thurgood Marshall moved the U.S. toward equality in education for all. Also in this area is the Austin History Center where you can find frescoes, ironwork and wood carvings by Austin’s finest craftsmen. Rolling hills and beautiful landscaping make up West Austin, which makes for the perfect place for the neighborhood&apos;s exceptional museums and nature reserves. Here, you’ll find yourself looking out to a fantastic view of the Hill Country on top of Mount Bonnell, or taking a dip in the landmark swimming pool that is Deep Eddy Pool. West Austin is also home to The Contemporary Austin-Laguna Gloria, complete with a sculpture park and Mediterranean villa-styled museum, which makes for a popular romantic spot. 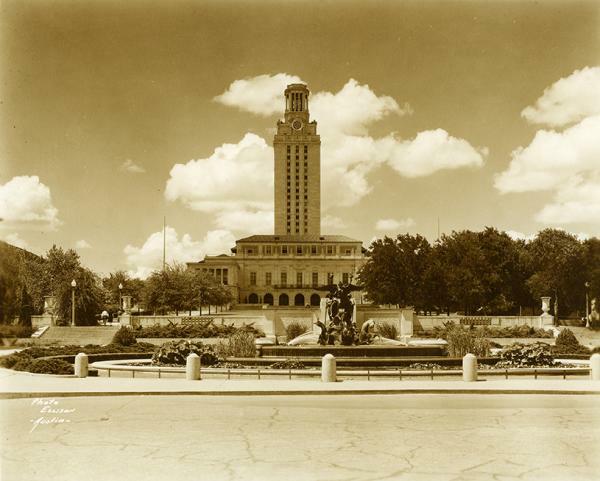 The University of Texas was founded in 1883. The architectural character of its landmark buildings was determined early in the 20th century by architect Cass Gilbert, followed by Paul Phillipe Cret. They designed buildings with limestone walls, red tile roofs and Spanish-Mediterranean details. The Main Building Tower, built in 1937, is the symbolic center of the university, with a variety of tower lighting schemes to signal athletic victories, academic honors and other special occasions. The original forty-acre campus has grown to encompass more than 350 acres, with large-scale buildings added to accommodate 50,000-plus students. The campus area is also home to a host of note-worthy museums such as the Harry Ransom Center, Blanton Museum of Art, Texas Natural Science Center’s Texas Memorial Museum, Neill-Cochran House Museum, Briscoe Center for American History and the LBJ Presidential Library and Museum. These are all open to the public and are must-visits for art and history lovers. Representative of the suburbs of Austin circa 1890, Hyde Park was remote from downtown Austin. Streetcar service made it possible for Austin’s first suburbanites to settle there. The shady streets are lined with handsome Victorian and Craftsman homes. Today, Hyde Park is now considered part of Central Austin, but still maintains its unique identity. There you can find the Elisabet Ney Studio and Museum, an art museum dedicated to the art and legacy of Ney, and houses the largest collection of her work in the world. Citizens of Austin enjoy a lush 350-acre park in the heart of the city thanks to the generosity of Andrew Jackson Zilker, an early Austin businessman and philanthropist. During the Great Depression, federally funded improvement projects enhanced the park’s natural beauty. 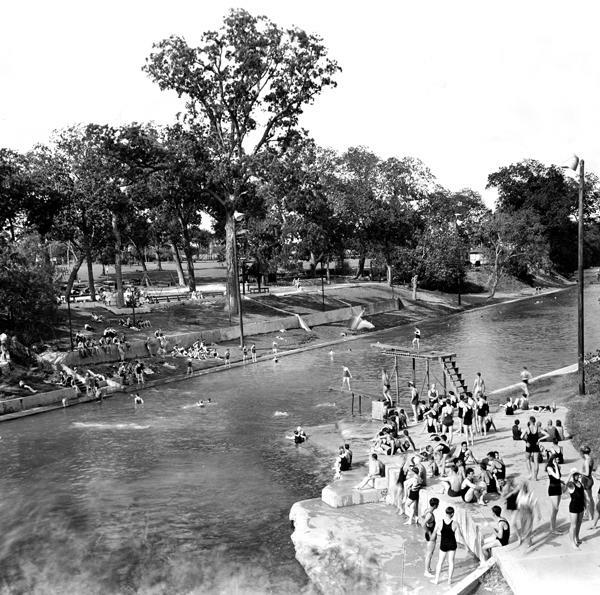 Just to the side of Zilker Park is the famous Barton Springs Pool, a natural spring-fed pool named after William Barton who arrived in the late 1830s. Barton Springs’ swimming hole is an Austin institution and local favorite way for cooling off on a hot summer day. Originally called Town Lake, Lady Bird Lake was created by a dam that was built on the Colorado River in 1960. It runs through the center of Austin, and on most days, you will find plenty of active locals and visitors taking brisk walks or bike rides around the riverfront. South of Lady Bird Lake is Old South Austin which can be access from downtown using the Ann W. Richards Congress Avenue Bridge, which is home to over 1.5 million Mexican free tailed bats (April-October). Once you’ve crossed the bridge, you’ll find yourself on historic South Congress Avenue. The buildings on South Congress, mostly from the 1930s, are modest, but have been adapted in creative ways for locally-owned shops and restaurants.